Washoe County Library System is proud to host this traveling exhibit from Mémorial de la Shoah in Paris. Reno, NV – February 28, 2017. Washoe County Library System and Mémorial de la Shoah, will host “Hélène Berr, A Stolen Life” an exhibit that was created, designed, and circulated by the Mémorial de la Shoah in Paris, France. The exhibit will be on display from March 1 through April 30, 2017 at Washoe County Library System Northwest Reno Library in Reno, Nevada. We invite you to experience the exhibit and 2 months of incredible events offered at the Northwest Reno Library. All library programs are free and open to the public. To help celebrate the exhibit, an opening reception for “Hélène Berr, A Stolen Life” is scheduled on Thursday, March 9 from 6:00–8:00pm. Registration to attend the opening reception is suggested. Please reserve your seat. Invited to deliver the opening address are Jeff Scott, Washoe County Library Director, Naomi Duerr, Reno City Councilwoman, Emmanuel Lebrun-Damiens, Consul General of France in San Francisco, and Jacques Fredj, Executive Director of Mémorial de la Shoah in Paris, France. Introductory presentations will take place from 6:00–7:00pm, followed by a reception and visit of the exhibition from 7:00–8:00pm at the Northwest Reno Library located at 2325 Robb Drive, Reno, Nevada. 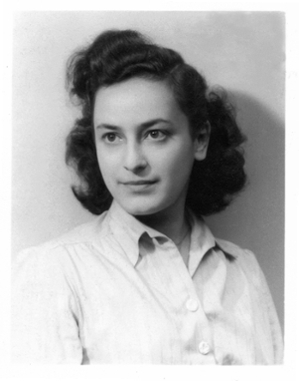 Hélène Berr, a young French-Jewish woman attending Sorbonne University in Paris, and was only 21 years old when she began writing her Journal. Berr’s future was cut short by the Vichy government’s laws and the extermination plan imagined by the Nazis. The year was 1942 and the anti-Jewish laws of Vichy started to radically change her life little by little. Until March of 1944, the date of her arrest, she wrote in her journal every day. In a deeply moving written account, this text mixes the daily experience of the unbearable with the ideal world of letters, alternating in every moment between hope and desperation. For sixty years, the manuscript of Hélène Berr’s diary did not exist except as a painful family heritage. One day in 2002, Mariette Job, Hélène’s niece, decided to entrust the manuscript with the Mémorial de la Shoah. Published by Tallandier in January of 2008, the diary met with vast success from the very beginning of its publication. The exhibit follows her steps through Paris under the German occupation and goes beyond the framework of the journal as it broadens the context of the Occupation and addresses the persecution of the Jews in France. Through this exhibition, the Mémorial de la Shoah offers the public the opportunity to discover several family documents archived at the museum’s documentation center, other archives that broaden the historical context, as well as reproductions of the original manuscript and an interactive map of Paris. Washoe County Library Director Jeff Scott stated, "We are extremely proud to host this exhibit and share the exceptional and moving account of Hélène Berr”. Scott continued “The goal of this collection is to help educate about the Holocaust, and to teach respect for human dignity and the value of cultural differences”. The Northwest Reno Library also houses the Shia Szrut Holocaust Memorial Collection, which contains materials encouraging tolerance and provides literature on the cause of World War II for teachers, students, and the public. In addition to featuring the life of Berr and her family through family documents and reproductions of the original diary, other archives that provide historical context of the daily lives of Jews impacted by the Nazi extermination plan will be on display. This exhibition was designed, created, and distributed by the Mémorial de la Shoah in Paris, France (curators Karen Taieb and Sophie Nagiscarde), with the guidance of Mariette Job (niece of Hélène Berr), and made possible through the generous support of SNCF. The exhibit, special collection, and programs are also made possible in part through the generous support of the Consulate General of France in San Francisco, the Embassy of France in the United States, Washoe County, Washoe County Library System, Friends of Washoe County Library, David J. Drakulich Foundation for Freedom of Expression, SNCF, Mémorial de la Shoah, United States Holocaust Memorial Museum, Governor’s Advisory Council on Education relating to the Holocaust, Ronald and Judy Mack, and the Rochlin Foundation, in partnership with the Sperling Kronberg Mack Holocaust Resource Center.